Only one glove/mitt worth mentioning from ebay this week and a lot of eyes were on it. The Reach "Joe Judge" model C base mitt sold for $649. It was near mint, very well made and a tough endorser. There was some minor mouse damage to the wrist strap and piping. It is a cool mitt with the buckle web feature and the overall look as if just off the store shelf. This glove came up in my eBay feed this morning but it looks like the seller had ended it already. At first I thought, wow, but on a second inspection, I have some reservations. What do you guys think? Fun glove but not original in any way. The original glove was probably a beat up 1" web youth glove. A full web was added and sewn into the thumb and forefinger. The button back was turned into a buckle back (youth models with cloth piping didn't have buckle backs) and the D&M tag was added to the forefinger. D&M never, ever, ever had a tag in that place on a fielders glove. Just a fun modification. I got a similar one from a guy in Michigan years ago. He was just having fun because he was such a good craftsman. Just hope the seller mentioned all the mods. I haven't seen the listing yet. RK is a good guy and probably had his doubts too so maybe that's why he took it down. Don't know. It looks like he took it down before your post so all good. Those are fun gloves. I loved the one I used to have. There are a bunch of them out there. Always great when you can find a nice glove at a reasonable price $65.00. Ebay listing showed a bad stain which cleaned up pretty good (which I still may work on) and a name on the heal, which ended up being in pencil. Great patch and interesting band around the whole glove. Close to near mint. Here's another one of those modified gloves. Hey Guys, long time no post from the Drokester. On these "fox paw" or Faux pas gloves, I hope my Stonewall Jackson "Confederate Preferred" fielders mitt doesn't get taken for the real deal after my passing and Lord forbid if my soon whooped up, fingerless, web less, tipped finger, P.G.T. Beauregard model falls into dishonest hands!!! On a serious note, I hope the baseballs I gave as gifts don't get passed for the real deal. An e-xray will show the are recovered modern baseballs. given out of friendship and love for you glovers like me. My Boy just graduated High School!!! Yeah!! A hurdle accomplished!!! I hadn't gotten him a graduation present, so on the way home, diploma in hand, I asked how much money he had received after graduation. he replied a couple hundred. As the father I am, I said "Boy, you are going shopping before we get home!" "You gotta start at the BOTTOM!" Yep, we stopped at a grocery store and he bought his first pack of toilet paper. He won't forget that life lesson!!! Today, me and Mutt went out and played catch, been way to long, I grabbed my Howie Pollett Nokona and he the glove I had hand made for him when he was 8 by Glovesmith. The deal is he will tryout when the Appalachian Leagues have their try out days, In Papaw Pete's old wool uniform....the next Sid Fitch??? P.S. where oh where is a Pepper Martin PM tonight????? Murph, I saw that Reach model 150 mitt on ebay. Nice job at removing that stain. 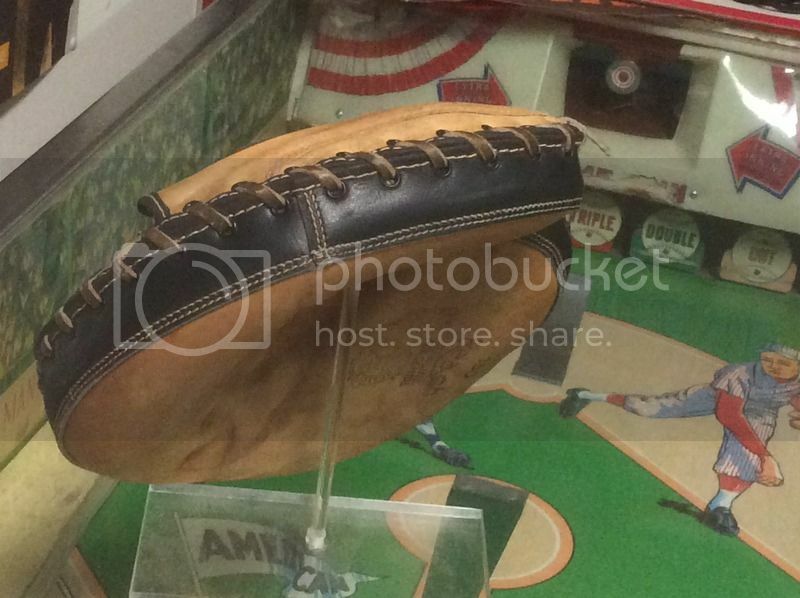 A 1940's Marathon "Tonny Lazzeri" model 4227 glove sold for $199 on ebay. These Lazzeri models show up with some regularity but this is the nicest in a long time. 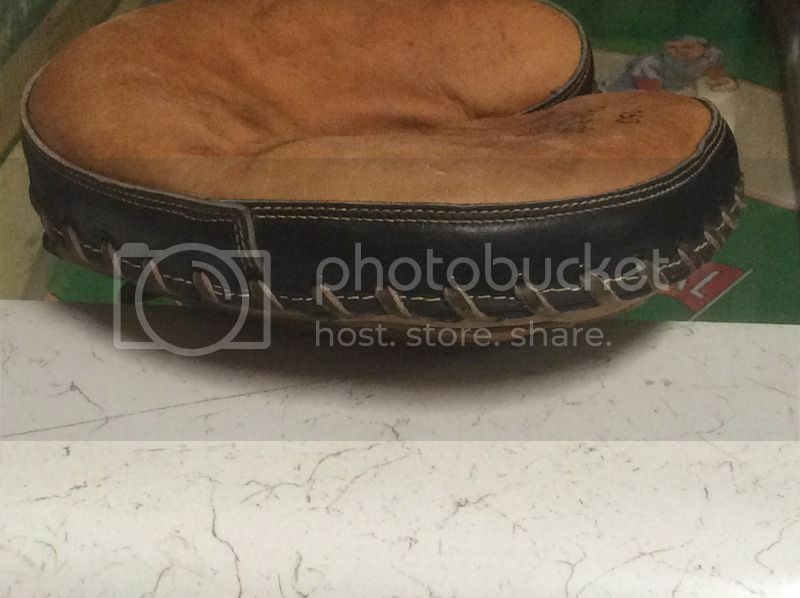 A 1950's Rawlings "Stan Musial" model PM and picture box sold for $549. Glove and box look in nice shape. This one sold pretty quickly for $150 on ebay. It's a Wilson "Lefty Grimm" buckle web model 550. It shows a fair amount of wear but surprisingly all there and intact. The factory markings on the face are really good and the cloth patch on the back is in decent shape. I think it was on Jared's want list. Hopefully he won it. It's a nice mitt and a worthy addition. Well it's not a LHT but I'm satisfied with the condition. Been on the hunt for that endorsement for a while and all of a sudden this one pops up. Didn't know they came in off white leather so that's a bonus. Along with the bold signature. Fairly nice example. Should clean up and look a lot better. A 1940's Nokona "Joe Jackson" model G51 glove sold for $542 at auction. The glove shows a fair amount of wear but seems all there and intact. I like the triple stitching around the wrist opening. Nokona did that for some of their better quality models. This one has no mfg. cloth patch and may have been a wartime issue. A 1960's Rawlings "Mickey Mantle" model GS12 HOH glove sold for $1175. It's in great shape. Not sure what is up with that model number but looks like the XPG6-H model. 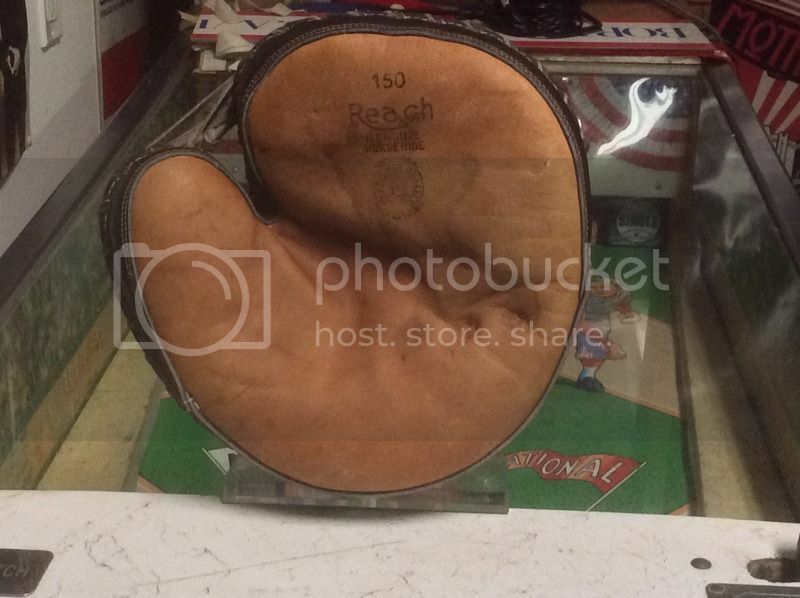 A 1950's Monarch "Del Rice" mitt and box sold for $250. The private label brand mitt seems well made. Probably made by Denkert. A 1950's Denkert "Del Crandall" mitt sold for $56. Striking black leather model. 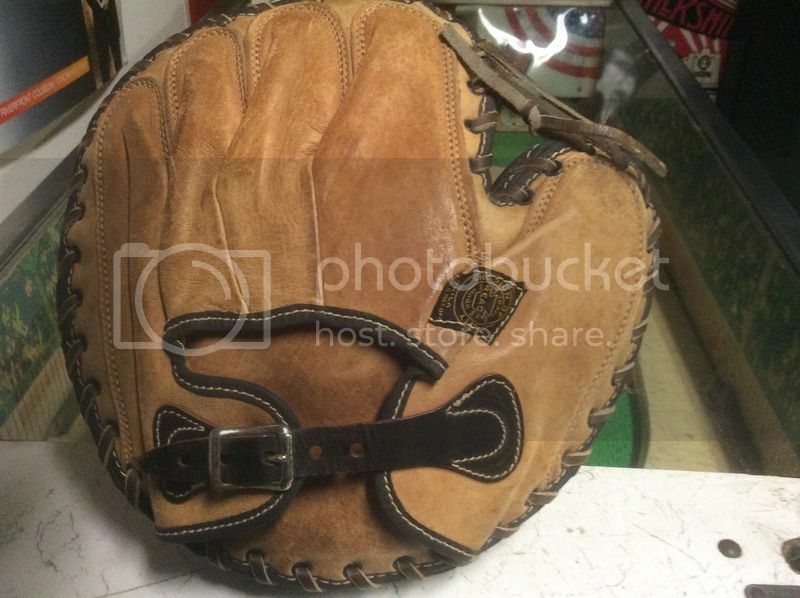 A 1960's MacGregor Model GA mitt sold for $76. Top of the line in its day.